Description: Japan-only CD reissue of Crown Records jazz albums! P-Vine Records of Japan should be congratulated for digging deep into the vaults of Crown Records, a Los Angeles-based label that existed from 1957 to 1972, and reissuing a series of great jazz albums, many of which had never been reissued on CD! Drummer Chico Hamilton, who is still going strong at age 91, is a truely unique visionary. In 1955, when jazz was beginning to flourish in many different directions, Hamilton made history by adopting an entirely new quintet format which includes a single reed instrument, guitar, cello, bass and drums. The cellist Fred Katz, who would mostly play with the bow, was considered as one of the "front" players. Reed player Paul Horn was the second horn player of the group who replaced the inaugural member Buddy Collette. The main part of this compilation album, released in 1963, is the four tracks (Track 5 through 8) taken from Fred Katz's recording session with Hamilton and Horn. They are interesting tracks with a mixture of free improvisation and the Third Stream-like classical influence. The rest are taken from two earlier recording sessions. 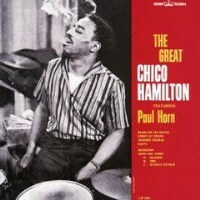 Tracks 1 and 3 were recorded in 1956 and features Hamilton's trio with the young Jim Hall, who was 25 years old at the time, and George Duvivier. Tracks 2 and 4 were recorded in 1953 with Howard Roberts and Duvivier. Recorded in December 1953 (Tracks 2 and 4), February 1956 (Tracks 1 and 3), and March 1957 (Tracks 5 through 8).